1.4.3.3 "The Reactionary Nature of the Socialist Conception"
All economic activity is carried out through time. Every individual economic process occupies a certain time, and all linkages between economic processes necessarily involve longer or shorter periods of time. The attack on economics sprang rather from a dislike of the application of scientific methods to the investigation of social problems. The existence of a body of reasoning which prevented people from following their first impulsive reactions, and which compelled them to balance indirect effects, which could be seen only by exercising the intellect, against intense feeling caused by the direct observation of concrete suffering, then as now, occasioned intense resentment. The reasons why the adoption of a system of central planning necessarily produces a totalitarian system are fairly simple. Whoever controls the means must decide which ends they are to serve. As under modern conditions control of economic activity means control of the material means for practically all our ends, it means control over nearly all our activities. The nature of the detailed scale of values which must guide the planning makes it impossible that it should be determined by anything like democratic means. The director of the planned system would have to impose his scale of values, his hierarchy of ends, which, if it is to be sufficient to determine the plan, must include a definite order of rank in which the status of each person is laid down. If the plan is to succeed or the planner to appear successful, the people must be made to believe that the objectives chosen are the right ones. Every criticism of the plan or the ideology underlying it must be treated as sabotage. There can be no freedom of thought, no freedom of the Press, where it is necessary that everything should be governed by a single system of thought. In theory Socialism may wish to enhance freedom, but in practice every kind of collectivism consistently carried thought must produce the characteristic features which Fascism, Nazism, and Communism have in common. Totalitarianism is nothing but consistent collectivism, the ruthless execution of the principle that 'the whole comes before the individual' and the direction of all members of society by a single will supposed to represent the 'whole'. The mechanism by which the interaction of democratic decisions and their implementation by the experts often produces results which nobody has desired is a subject which would deserve much more careful attention than it usually receives. Yet, though the French Revolution was so largely inspired by the ideal of the Rule of Law, it is questionable whether it really helped the advance towards that ideal. In its course too many different aspirations gained influence which it was difficult to reconcile with that ideal. What all this amounts to, then, is that the Rule of Law requires that administrative discretion in coercive action (i.e., in interfering with the person and property of the private citizen) must always be subject to review by an independent court which is not an instrument of, or even privy to, the aims of current governmental policy; that its review must in all such instances extend to the substance of the administrative act and not merely to the question whether it was infra or ultra vires; and that, if such a court finds that the rights of private citizens have been infringed, it will assess damages just as if the right of this person had been violated by another private citizen. This, in addition to the familiar requirements of generality, equality, and certainty of the law is really the crux of the matter, the decisive point on which it depends whether the Rule of Law prevails or not. I believe that the main lesson which our generation has learnt is that we must find a new limit for the activities of government, a limit which leaves ample scope for sensible experimentation but which secures the freedom of the individual as the mainspring of all social and political activity. The whole purpose of these lectures has been to suggest that we can find such a limit if we are willing to revive and develop the ancient ideal of the Rule of Law. [Apartheid] appears to be a clear and even extreme instance of that discrimination between different individuals which seems to me to be incompatible with the reign of liberty. The essence of what I said [in The Constitution of Liberty] was really the fact that the laws under which government can use coercion are equal for all responsible adult members of that society. Any kind of discrimination — be it on grounds of religion, political opinion, race, or whatever it is — seems to be incompatible with the idea of freedom under the law. Experience has shown that separate never is equal and cannot be equal. 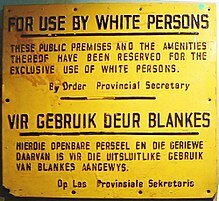 [Apartheid law in South Africa] appears to be a clear and even extreme instance of that discrimination between different individuals which seems to me to be incompatible with the reign of liberty. The essence of what I said [in The Constitution of Liberty] was really the fact that the laws under which government can use coercion are equal for all responsible adult members of that society. Any kind of discrimination — be it on grounds of religion, political opinion, race, or whatever it is — seems to be incompatible with the idea of freedom under the law. Experience has shown that separate never is equal and cannot be equal. "Conversation with Systematic Liberalism," Forum (September 1961). Since the value of freedom rests on the opportunities it provides for unforeseen and unpredictable actions, we will rarely know what we lose through a particular restriction of freedom. Perhaps I'm unrealistic. As long as people do not fully realize the danger of inflation, they may well pressure for more inflation as a short-term remedy for evils. Though we may well be driven into more, until people have learned the lesson, but that means that inflation may still do more of a great deal of harm, before it will be cured. 1975 interview on "Meet the Press." The sentence, 'stopping the printing presses,' is a figurative expression, because it is being done now by creating credit by the Federal Reserve System. But this is government action — all inflation is ultimately the result of activities which government determines and can control. And all inflations have been stopped in the past by the government stopping creating money, or preventing the central bank from creating more money. May I add just one thing? See, all inflations have been stopped by people who created or believed in a very naive form of the Quantity Theory, and acted on that. It may be wrong, but it is the only adequate theory effective to stop an inflation. What struck me most in this conversation was a radical passion for truthfulness in everything (which I came to know as a characteristic vogue among the young Viennese intellectuals of the generation immediately preceding mine only in the following university years). This truthfulness became almost a fashion in that border group between the purely Jewish and the purely Gentile parts of the intelligentsia in which I came so much to move. It meant much more than truth in speech. One had to "live" truth and not tolerate any pretence in oneself or others. It sometimes produced outright rudeness and, certainly, unpleasantness. Every convention was dissected and every conventional form exposed as fraud. Wittgenstein merely carried this further in applying it to himself. I sometimes felt that he took a perverse pleasure in discovering falsehood in his own feelings and that he was constantly trying to purge himself of all fraud. "Remembering My Cousin, Ludwig Wittgenstein", Encounter (August 1977). Page 20. The next time I met Ludwig Wittgenstein was in the spring of 1928 when the economist Dennis Robertson, who was taking me for a walk through the Fellows' Gardens of Trinity College, Cambridge, suddenly decided to change course because on the top of a little rise he perceived the form of the philosopher draped over a deckchair. He evidently stood rather in awe of him, and he did not wish to disturb him. "Remembering My Cousin, Ludwig Wittgenstein", Encounter (August 1977). Page 21. I have arrived at the conviction that the neglect by economists to discuss seriously what is really the crucial problem of our time is due to a certain timidity about soiling their hands by going from purely scientific questions into value questions. This is a belief deliberately maintained by the other side because if they admitted that the issue is not a scientific question, they would have to admit that their science is antiquated and that, in academic circles, it occupies the position of astrology and not one that has any justification for serious consideration in scientific discussion. It seems to me that socialists today can preserve their position in academic economics merely by the pretense that the differences are entirely moral questions about which science cannot decide. Nobody who has lived through the rise of the violent anti-Semitism which led to Hitler can refuse Mrs. Thatcher admiration for her courageous and outspoken warning. When I grew up in Vienna the established Jewish families were a generally respected group and all decent people would frown upon the occasional anti-Jewish outbursts of a few popular politicians. It was the sudden influx of large numbers of Galician and Polish Jews [during World War I] … which in a short period changed the attitude. They were too visibly different to be readily absorbed. I have certainly never contended that generally authoritarian governments are more likely to secure individual liberty than democratic ones, but rather the contrary. This does not mean, however, that in some historical circumstances personal liberty may not have been better protected under an authoritarian than democratic government. (...) More recently I have not been able to find a single person even in much maligned Chile who did not agree that personal freedom was much greater under Pinochet than it had been under Allende. Nor have I heard any sensible person claim that in the principalities of Monaco or Lichtenstein, which I am told are not precisely democratic, personal liberty is smaller than anywhere else! She was a very good-looking woman, and extremely intelligent. But she wasn’t really very female; she had too much of a male intelligence. I don’t have many strong dislikes. I admit that as a teacher—I have no racial prejudices in general—but there were certain types, and conspicuous among them the Near Eastern populations, which I still dislike because they are fundamentally dishonest. And I must say dishonesty is a thing I intensely dislike. It was a type which, in my childhood in Austria, was described as Levantine, typical of the people of the eastern Mediterranean. But I encountered it later, and I have a profound dislike for the typical Indian students at the London School of Economics, which I admit are all one type—Bengali moneylender sons. They are to me a detestable type, I admit, but not with any racial feeling. I have found a little of the same amongst the Egyptians —basically a lack of honesty in them. If I advise speaking about honesty, I think honesty is really the best expression of what I call the morals of a civilized society. Primitive man lacks a conception of honesty. "Why I am Not a Conservative"
I must confess that if I had been consulted whether to establish a Nobel Prize in economics, I should have decidedly advised against it. I feared that such a prize, as I believe is true of the activities of some of the great scientific foundations, would tend to accentuate the swings of scientific fashion. This apprehension the selection committee has brilliantly refuted by awarding the prize to one whose views are as unfashionable as mine are. My whole concept of economics is based on the idea that we have to explain how prices operate as signals, telling people what they ought to do in particular circumstances. The approach to this problem has been blocked by a cost or labor theory of value, which assumes that prices are determined by the technical conditions of production only. The important question is to explain how the interaction of a great number of people, each possessing only limited knowledge, will bring about an order that could only be achieved by deliberate direction taken by somebody who has the combined knowledge of all these individuals. However, central planning cannot take direct account of particular circumstances of time and place. Additionally, every individual has important bits of information which cannot possibly be conveyed to a central authority in statistical form. In a system in which the knowledge of relevant data is dispersed among millions of agents, prices can act to coordinate the separate actions of different individuals. Given this context, it is intellectually not satisfactory to attempt to establish causal relations between aggregates or averages in the manner in which the discipline of macroeconomics has attempted to do. Individuals do not make decisions on the basis of partial knowledge of magnitudes such as the total amount of production, or the total quantity of money. Aggregative theorizing leads nowhere. I think the basic misconception is to speak of the so-called “best” allocation of resources. What is the best? In common economics it is defined as what would be if we knew everything. Economists operate with the fictitious assumption that all the relevant data is known, but this is totally unrealistic. Nobody knows all the data. What we have is widely dispersed knowledge, which cannot be concentrated in one mind. To call the situation—which would use all the knowledge available—“optimal” is nonsense because it is by definition a non-achievable solution. Our problem is not the full utilization of all knowledge but the best use we can achieve with any known institutional structure. In that sense, some oligopolistic (and even monopolistic situations), represent the best possible utilization of knowledge that we can achieve. Even the action of a monopolist can be extremely beneficial. There is no doubt, and in this I agree with Milton Friedman, that once the Crash had occurred, the Federal Reserve System pursued a silly deflationary policy. I am not only against inflation but I am also against deflation! So, once again, a badly programmed monetary policy prolonged the depression! So, once again, a badly programmed monetary policy prolonged the depression. One consequence of this policy was, of course, the fact that confidence was destroyed. I’m all for reduction of government expenditures but to anticipate it by reducing the rate of taxation before you have reduced expenditure is a very risky thing to do. And since any inflation, however modest at first, can help employment only so long as it accelerates, adopted as a means of reducing unemployment, it will do so for any length of time only while it accelerates. We live in a world where three moral traditions are in constant conflict, the innate ones, the traditional ones, and the intellectually designed ones, and ultimately, all our political conflicts of this time can be reduced as affected by a conflict between free moral tradition of a different nature, not only of different content. There is no salvation for Britain unless the special privileges granted to the trade unions in 1906 are revoked. The average level of real wages of British workers would undoubtedly be higher, and their chances of finding employment better, if the wages of different occupations were again determined by the market and all limitations on the work an individual is allowed to do were removed. On the scale on which [tax cutting] is being tried, I’m a little apprehensive. I’m all for reduction of government expenditures but to anticipate it by reducing the rate of taxation before you have reduced expenditure is a very risky thing to do. I don't know what monetarism is. If monetarism just means a good old-fashioned quantity theory, of course it has not failed. If it means the particular version of Milton Friedman, I think it has because he imagines that he can achieve — ascertain — a clear quantity relationship between a measurable quantity of money and the price level. I don't think that is possible. In fact, just about 40 years ago in the opening sentences of my book, Prices and Production, I wrote that it would be a great misfortune if people ever cease to believe in the quantity theory of money. It would be even worse ever to believe it literally. And that's exactly what Milton Friedman does. I don't like criticizing Milton Friedman not only because he is an old friend but because, outside of monetary theory, we are in complete agreement. Our general views on what is desired and what is not are almost identical until we get on to money. But if I told him what I said before, that I very much doubt whether monetary policy has ever done anything good, he would disagree. He personally is convinced that a good monetary policy is a foundation for everything. The human groups have been selected for the effects of their habitual practices, effects of which the individuals were not and could not be aware. Customs are mostly group properties, beneficial only if they are common properties of its individual members but referring to reciprocal action. All the paradigms of culturally evolved institutions, morals, exchange, and money refer to such practices whose benefits transcend the individuals who practice them in the particular instances. The result is that whole groups may be helped by them to expand into what I shall call extended orders, through the effects of practices of which the individuals are not aware. Such practices can lead to the formation of orderly structures far exceeding the perception of those whose actions produce them. It is no exaggeration to say that the central aim of socialism is to discredit those traditional morals which keep us alive. Those who suffer from this monopoly should form a libertarian anti-labour union movement of workers directed against what has long become a deceptive farce favouring an elite that has gained dominance in a party wrongly claiming to represent the interest of all workers. Once it is recognized that the unions prevent people from getting jobs, such a movement may readily spread. Our basic problem is that we have three levels, I would say, of moral beliefs. We have the first instance, our intuitive moral feelings which are adapted to the small, person-to-person society where we act for people whom we know and are served by people whom we know. Then, we have a society governed by moral traditions which, unlike what modern rationalists believe, are not intellectual discoveries of men who designed them, but as a result of a persons, which I now prefer to describe as term of 'group selection.' Those groups who had accidentally developed such as the tradition of private property and the family who did succeed, but never understood this. So we owe our present extended order of human cooperation very largely to a moral tradition which the intellectual does not approve of, because it has never been intellectually designed and it has to compete with a third level of moral beliefs, those which the morals which the intellectuals designed in the hope that they can better satisfy man's instincts than the traditional morals to do. And we live in a world where three moral traditions are in constant conflict, the innate ones, the traditional ones, and the intellectually designed ones, and ultimately, all our political conflicts of this time can be reduced as affected by a conflict between free moral tradition of a different nature, not only of different content. I mean, it became particularly acute because Keynes, against his intentions, had stimulated the development of macroeconomics. And I was convinced that not only his particular conclusions, but the whole foundation of macroeconomics was wrong. So I wanted to demonstrate that we had to return to microeconomics, that this whole prejudice supported by the natural scientists that could deduce anything from measurable magnitudes, the effects of aggregates and averages, came to fascinate me much more. I felt in a way, that the thing which I am now prepared to do, I don’t know as there’s anybody else who can do this particular task. And I rather hoped that what I had done in capital theory would be continued by others. This was a new opening which was much more fascinating. The other would have meant working for a result which I already knew, but had to prove it. Which was very dull. The other thing was an open problem: How does economics really look like when you recognize it as the prototype of a new kind of science of complex phenomena which could not employ the simple model of mechanics or physics, but had to deal with what then I described as mere pattern predictions, certain limited prediction. That was so much more fascinating as an intellectual problem. I am now profoundly convinced of what I had only hinted at before, namely, that the struggle between the advocates of a free society and the advocates of the socialist system is not a moral but an intellectual conflict. Thus socialists have been led by a very peculiar development to revive certain primitive instincts and feelings which in the course of hundreds of years had been practically suppressed by commercial or mercantile morals, which by the middle of the last century had come to govern the world economy. Questions about the influence of socialism are increasingly more difficult to answer as the word socialism has so many meanings. The idea that the inequalities of incomes can be greatly reduced has come to be recognized as largely impractical. Practically all endeavours at just distribution express more or less arbitrary conceptions of what is just and the central idea of Marxian socialism of a rationalisation of the means of production has been largely abandoned as technically impracticable. I believe that in general the idea of justice is more closely met by a freely competitive market than by any deliberate allocation of income to some imagined ideal of the kind. You cannot successfully use your technical knowledge unless you are a fairly educated person, and, in particular, have some knowledge of the whole field of the social sciences as well as some knowledge of history and philosophy. Of course real competence in some particular field comes first. Unless you really know your economics or whatever your special field is, you will be simply a fraud. But if you know economics and nothing else, you will be a bane to mankind, good, perhaps, for writing articles for other economists to read, but for nothing else. An evil fate befall German efforts to defend the ideal of liberty in general and in the field of economics in particular, with the result that today I am almost the only survivor of a generation that set out in the wake of the First World War to devote all its energies to the preservation of a civilised society, a generation that set itself the task to build a better society in a systematic fashion and to learn to understand, an to some extent defend, a tradition that had civilised the world. Life at Cambridge during those war years was to me particularly congenial, and it completed the process of thorough absorption in English life which, from the beginning, I had found very easy. Somehow the whole mood and intellectual atmosphere of the country had at once proved extraordinarily attractive to me, and the conditions of a war in which all my sympathies were with the English greatly speeded up the process of becoming thoroughly at home—much more than in my native Austria from which I had already become somewhat estranged during the conditions of the 1920s. While neither on my early visit to the United States nor during my later stay there or still later in Germany did I feel that I really belonged there, English ways of life seemed so naturally to accord with all my instincts and dispositions that, if it had not been for very special circumstances, I should never have wished to leave the country again. And of all the forms of life, that at one of the colleges of the old universities...still seems to me the most attractive. The evenings at the High Table and the Combinations Room at King's are among the pleasantest recollections of my life, and some of the older men I came then to know well, especially J.H.Clapham, remained, while they lived, dear friends. I did say in print, in February, 1929 that there was no hope for economic recovery in Europe before American interest rates came down. That wouldn’t be until the American boom collapsed — which was likely to happen within the next few months.And this did, in fact, happen in October 1929. What made me expect this, of course, was one of my main theoretical beliefs — that an inflationary boom cannot be maintained indefinitely. I was sure that a very unstable situation was created by the artificial prolongation of the boom in 1927, when the Federal Reserve tried to stave off a collapse by credit expansion. I don’t believe we’re in for a crash now. It's much more likely that government will just conceal the continuation of inflation by price controls. But if anything is worse than an open inflation, it’s a repressed inflation. What you’re likely to get is not a violent deflation but increasing stagnation of productivity. If the world as a whole returned to the gold standard there would be such fluctuations in the value of gold that it would very soon prove impractical. Today an international gold standard could only mean that a few countries would maintain a real gold standard. The other countries would hang on to the system through a gold exchange standard — where the currency isn't really redeemable in gold but the government attempts to keep a fixed rate between its currency and gold. If a big country like the United States did return to the gold standard, it would start a great deflation. Most likely the government couldn't stick to it for long. They'd switch the policy to some halfway measure like a gold exchange standard. The advice I would give is: If you have the courage to do so, don't feel patriotic in monetary matters. Choose the money which helps you best. When I look at the world, I sometimes feel that here in Germany one may still be in some sort of lifeboat that can hope to keep afloat when the rest of the world goes bust. German and Switzerland and perhaps Austria and Belgium have the few relatively stable currencies in the world. The illiterate expression ‘given data’ constantly recurs in Lange. It appears to have an irresistable attraction to mathematical economists because it doubly assures them that they know what they do not know. It seems to bewitch them into making assertions about the real world for which they have no empirical justification whatever. What the planning authority would have to know would not be the mere totals but the distinct, peculiar conditions prevailing in each enterprise which affect the information about values transmitted through market prices but would be completely lost in any statistical information about quantities that might reach the authority from time to time. There mere idea that the planning authority could ever possess a complete inventory of the amounts and qualities of all the different materials and instruments of production of which the manager of a particular plant will know or be able to find out makes the whole proposal a somewhat comic fiction. Once this is recognised it becomes obvious that what prices ought to be can never be determined without relying on competitive markets. "Coping with Ignorance," The Ludwig von Mises Memorial Lecture, Originally published in Imprimis 7 (Hillsdale, Michigan: Hillsdale College, July 1978). Later reprinted in Cheryl A. Yurchis (ed.) Champions of Freedom (The Ludwig von Mises Lecture Series Vol. 5; Hillsdale, Michigan: Hillsdale College Press, 1979). The misconception that costs determined prices prevented economists for a long time from recognizing that it was prices which operated as the indispensable signals telling producers what costs it was worth expending on the production of the various commodities and services, and not the other way around. It was the costs which they had expended which determined the prices of things produced. It was this crucial insight which finally broke through and established itself about a hundred years ago through the so-called marginal revolution in economics. The chief insight gained by modern economists is that the market is essentially an ordering mechanism, growing up without anybody wholly understanding it, that enables us to utilize widely dispersed information about the significance of circumstances of which we are mostly ignorant. However, the various planners (and not only the planners in the socialist camp) and dirigists have still not yet grasped this. The social sciences building at the University of Chicago indeed still bears since it was built 40 years ago on its outside an inscription taken from the famous physicist Lord Kelvin: "When you cannot measure, your knowledge is meager and unsatisfactory." I will admit that that may be true, but it is certainly not scientific to insist on measurement where you don't know what your measurements mean. There are cases where measurements are not relevant. What has done much damage to microeconomics is striving for a pseudo-exactness by imitating methods of the physical sciences which have to deal with what are fundamentally much more simple phenomena. And the assumption that it is possible to ascertain all the relevant particular facts still completely dominates the alternative methods of dealing with our constitutional ignorance, which economists have tried to overcome. This of course, is what has come to be called macroeconomics as distinct from microeconomics. It seems to me more and more that the immense efforts which during the great popularity of macroeconomics over the last thirty or forty years have been devoted to it, were largely misspent, and that if we want to be useful in the future we shall have to be content to improve and spread the admittedly limited insights which microeconomics conveys. I believe it is only microeconomics which enables us to understand the crucial functions of the market process: that it enables us to make effective use of information about thousands of facts of which nobody can have full knowledge. I suggested before that the whole of economic history could be rewritten in terms of this gradual suppression of the primitive in­stincts by what we very mistakenly call “artificial” rules. Of course, they are not in the strict sense artificial. Nobody ever invented them. They were not the result of design. The new manners of conduct were not adopted because anybody thought they were better. They were adopted because somebody who acted on them profited from it and his group gained from it, and so these rules, without anybody under­ standing them—that is very important for the later part of my argu­ment—without anybody understanding in what way they benefited their community, gradually came to be generally accepted. There can be no doubt that our innate moral emotions and instincts were acquired in the hundreds of thousand years—probably half a million years—in which Homo sapiens lived in small hunting and gathering groups and developed a physiological constitution which governed his innate instincts. These instincts are still very strong in us. Yet civilization developed by our gradually learning cultural rules which were trans­mitted by teaching and which served largely to restrain and suppress some of those natural instincts. "The Reactionary Nature of the Socialist Conception"
I believe you will be shocked by my stating this so bluntly because we are still guided instinctively by those inherited "natural" emotions... in a sense we are all socialist. Those communities who adopted the new rules and, in doing so, infringed upon deeply embedded natural feelings became the successful ones, the ones who multiplied because they were more prosperous and were able to attract people from other groups. We have found a method of creating an order of human co–operation which far exceeds the limits of our knowledge. We are led to do things by circumstances of which we are largely unaware. We do not know the needs which we satisfy, nor do we know the sources of the things which we get. We stand in an enormous framework into which we fit ourselves by obeying certain rules of conduct that we have never made and never understood, but which have their reason. We do not owe our morals to our intelligence: we owe them to the fact that some groups uncomprehendingly accepted certain rules of conduct — the rules of private property, of honesty, and of the family — that enabled the groups practising them to prosper, multiply, and gradually to displace the others. Our morality itself is the result of a process of cultural selection. Those things survive which enable the species to multiply. Since only actions aimed at perceived benefit to others were, to Aristotle's mind, morally approved, actions solely for personal gain must be bad. That commercial considerations may not have affected the daily activities of most people does not mean however that over any prolonged period their very lives did not depend on the functioning of a trade that enabled them to buy essentials. That production for gain which Aristotle denounced as unnatural had -- long before his time -- already become the foundation of an extended order far transcending the known needs of other persons. Whereas, in fact, specialised students, even after generations of effort, find it exceedingly difficult to explain such matters, and cannot agree on what are the causes or what will be the effects of particular events. The curious task of economics is to demonstrate to men how little they really know about what they imagine they can design. Ch. 5: The Fatal Conceit. If craftsmen and blacksmiths were feared for transforming material substance, if traders were feared for transforming such intangible qualities as value, how much more will the banker be feared for the transformations he effects with the most abstract and immaterial of all economic institutions? Thus we reach the climax of the progressive replacement of the perceivable and concrete by abstract concepts shaping rules guiding activity: money and its institutions seem to be beyond the boundary of laudable and understandable physical efforts of creation, in a realm where the comprehension of the concrete ceases and incomprehensible abstractions rule. The most important player on Ronald Reagan's economic team is Ronald Reagan. The person most responsible for creating the economic program that came to be known as Reaganomics is Reagan himself. For over twenty years he observed the American economy, read and studied the writings of some of the best economists in the world, including the giants of the free market economy — Ludwig von Mises, Friedrich Hayek and Milton Friedman — and he spoke and wrote on the economy, going through the rigorous mental discipline of explaining his thoughts to others. Over the years he made all the key decisions on the economic strategies he finally embraced. He always felt comfortable with his knowledge of the field and he was in command all the way. At Chicago, Hayek put aside his more technical economic work for the development of a social and political theory that became in time the most ambitious and complete synthesis to emerge from the ranks of the post-war Right. Among its themes — the overriding significance of the rule of law, the need for social inequality, the function of unreflective tradition, the value of a leisured class — were many cultivated by Strauss across the campus. Neither thinker, however, ever referred to the other. Did temperamental antagonism, or intellectual indifference, dictate the silence? Whatever the case, latent tensions of outlook between them were to find expression in due course. Schmitt, on the other hand, was never far from Hayek's mind – standing for the prime example of a skilled jurist whose sophistry helped to destroy the rule of law in Germany, yet a political theorist whose stark definitions of the nature of sovereignty and the logic of party, at any rate, had to be accepted. Oakeshott, whose technical theory afforded no space for the nation-state, since collective solidarity was not a principle of civil association, had – as might be expected – nothing to say about the problems of a supra-national one. Asked his view of Britain’s entry into the EEC in the early sixties, Noel Annan reports, he replied: ‘I do not find it necessary to hold opinions on such matters.’ Hayek, on the other hand, held firm and far-seeing ones. As early as 1939, he argued in his prophetic essay ‘The Economic Conditions of Inter-State Federalism’ that transcendence of national sovereignty in a supra-national framework should be of natural advantage to a free economy, since the higher the plane on which its structural parameters were set – that is, the remoter from local faction and interest – the more insulated they would be from popular passion. In other words: the less immediately democratic the machinery of decision, the safer it was likely to be for the reproduction of capital. Of course, this was less a logical deduction than an empirical wager – that the task of constructing a supra-national popular sovereignty, capable of determining the social path of a supra-national economy, would prove impossible. That calculation has yet to be confounded, as the terms of union agreed at Maastricht – a central monetary authority for Europe, without any commensurate elected assembly – show. There was from the beginning a third vision of what European integration should mean, distinct from either federalist or inter-governmentalist conceptions of the Community. Its far-sighted theorist was Hayek, who even before the Second World War had envisaged a constitutional structure raised sufficiently high above the nations composing it to exclude the danger of any popular sovereignty below impinging on it. In the nation-state, electorates were perpetually subject to dirigiste and redistributive temptations, encroaching on the rights of property in the name of democracy. But once heterogeneous populations were assembled in an inter-state federation, as he called it, they would not be able to re-create the united will that was prone to such ruinous interventions. Under an impartial authority, beyond the reach of political ignorance or envy, the spontaneous order of a market economy could finally unfold without interference [...] With the abrupt deterioration in the global economic climate in the 1970s, and the general neo-liberal turn that followed in the 1980s, Hayekian doctrine was rediscovered throughout the West. The leading edge of the change came in the UK and US, with the arrival of Thatcher and Reagan. Continental Europe never produced comparably radical regimes, but the ideological atmosphere shifted steadily in the same direction. The collapse of the Soviet bloc sealed the transformation of working assumptions. By the 1990s, the Commission was openly committed to privatisation as a principle, pressed without embarrassment on candidate countries along with other democratic niceties. Its most powerful arm had become the Competition Directorate, striking out at public sector monopolies in Western and Eastern Europe alike. In Frankfurt the Central Bank conformed perfectly with Hayek’s prewar prescriptions. What was originally the least prominent strand in the weave of European integration had become the dominant pattern. Federalism stymied, inter-governmentalism corroded, what had emerged was neither the rudiments of a European democracy controlled by its citizens, nor the formation of a European directory guided by its powers, but a vast zone of increasingly unbound market exchange, much closer to a European ‘catallaxy’ as Hayek had conceived it. [Estonian Prime Minister] Mart Laar came to my office the other day to recount his country's remarkable transformation. He described a nation of people wh are harder-working, more virtuous — yes, more virtuous, because the market punishes immorality — and more hopeful about the future than they've ever been in their history. I asked Mr. Laar where his government got the idea for these reforms. Do you know what he replied? He said, "We read Milton Friedman and F. A. Hayek". People sometimes say that they don’t know what they think until they’ve said it, you know. But mind you, even as a graduate student, I’ve never thought that utility theory implies consciousness. Of course you discover things and learn about your own preferences. This is a point that I haven’t explored and that I probably should study more. It seems especially important from the point of view of innovation. By the way, what has always bothered me about Hayek is that all this local knowledge has to be transmitted before the process of social interaction can generate any new knowledge, but he doesn’t show us how that is going to happen. Right after we published our first findings, we started getting letters from all over the country saying, "You know, all you guys have done is rediscover Austrian economics" … I admit I wasn't familiar with Hayek and von Mises as the time. But now that I've read them, I can see that this is essentially true. As the title of his 1941 book indicates, the theory of capital lay at the heart of his theory of the cycle. The reason is that he attributes the cycle not to changes in aggregate demand, or even to changes in the quantity of capital, but to changes in the structure of production and hence the structure of the capital stock. In this, his theory was highly unusual: one of the reasons for his failure to engage more effectively with Keynes was the latter’s inability to see how the theory of capital could be of any importance for the cycle. Because the theory of capital is so central, and because it is so complex, it needs to be explained carefully. After that, the rest of his theory falls into place comparatively easily. F. A. Hayek, probably the most prominent advocate of capitalism in the present period would not quite agree with Smith's notions of what is natural, but his defense of capitalism is indirect by reference to its linkage with liberty, and he explicitly rejected the idea that a legitimating concept of justice is relevant to the operations of a market system. It may not be amiss to seen in my calculations of comparative productivity [between entrepreneurial economics and communist economies] verification of a prescient forecast [made by Hayek in 1935 in his essay "The Present State of the Debate".]. There were many Hayeks: Hayek, the political scientist; Hayek, the economist; Hayek, the philosopher of social science; Hayek, the psychologist. Even in these different roles, he played many parts. Why did his interest in the concept of spontaneous order and the history of the doctrine of unintended social consequences undergo very little development after the 1960s? All of his political writings are in fact amazingly repetitious, exploring a small number of big themes which, however, are not further refined or extended in new contexts. As organizing concepts, they held, I am convinced, enormous potentialities but nevertheless Hayek himself failed to realize them. Hayek’s reasons for holding that planning cannot work are not limited to the problem that the information required for the task of coordinating the plans of a multitude of individuals is too vast to organize effectively. The knowledge utilized within the market by entrepreneurs does not exist outside that local context and thus cannot even be organized in principle. It is not that planners would face a complex computational task; it is that they face an impossible task, because the knowledge required is not accessible to them no matter what technological developments may come along to ease the computational burden. I did fully learn from Hayek the distinction between what I later called moral community and moral order and moral anarchy – this is about the sense that our genetic predisposition is all for the insider tribe. An essential difference between Hayek and Friedman here was that Hayek was in many ways a dark thinker. If you read Hayek in the 1930s and 1940s, the thinks the world is coming apart. Certainly Hayek's response to the Great Depression was not one that imbued with a great deal of optimism. He thought that to a certain extent you just have to wait things out; if you try to intervene to solve the problem you'll only exacerbate it. Whereas Friedman was this tremendous optimist. Friedman was always emphasizing--he said that what Hayek and Robbins got wrong when they were responding to the Great Depression was precisely that: that they said you shouldn't do anything. He thought that part of what he was doing in monetary theory was to try to come up with a way to say that there was a solution, something that could be done that would prevent this kind of problem. A kind of counternarrative to Keynes. And he always emphasized--instead of dwelling on the catastrophic situation that the world was in, he always emphasized the ways in which those catastrophes could be solved by the market. And so when you reach this moment of deep pessimism that I think a lot of people associated with organizations like the Tea Party felt, Hayek in many ways feels more consonant with that set of views. Hayek was no opponent of theory; indeed, he frequently defended it from its historicist detractors. But he also understood the limitations of theory. I grant that there is one big defect in the neoclassical approach to imperfect knowledge. But it is a defect that Austrians almost never mention! The problem: Do the probabilities that people assign fit the facts? At least as researchers, most economists assume that beliefs about the world are on average correct. But empirically, this is often not so. Flying is much safer statistically than driving, but many people refuse to accept the fact. A large field known as behavioral economics documents such biases. Or to take more policy-relevant beliefs: Basic economics shows us the benefits of free trade, but few non-economists recognize them. I have a series of papers on systematically biased beliefs about economics that explores this topic. This is ridiculous. By this standard not only does Hayek get credit for ideas that he did not anticipate; he gets credit for ideas that preceded his birth! Hayek made some contributions here - though frankly he was very repetitious. But he did little to advance modern rational expectations theorizing, and even less to anticipate its empirical weaknesses. Would I have done any better? Probably not, but if I hadn’t done a lot more I wouldn’t want my posthumous admirers showering me with undeserved credit. (Well, maybe I would, but I wouldn’t deserve it). Bryan Caplan, "Why I Am Not An Austrian Economist ... And Why You Shouldn’t Be Either"
I've long since lost all patience with Hayek. His original, true ideas could have been five good blog posts, his errors and bizarre obsessions are numerous, and his writing style insults every person who ever tried to write a decent sentence. Bryan Caplan, "Two Takes on Hayek's Flabbiness"
In fact, a large part of what we think of as economic activity is designed to accomplish what high transaction costs would otherwise prevent or to reduce transaction costs so that individuals can negotiate freely and we can take advantage of that diffused knowledge of which Friedrich Hayek has told us. I will be discussing what happened in economics in England, but these were times when, to a very considerable extent, this was what happened in economics. The first episode I will discuss is local, but the economists involved were among the best in the world. In February 1931, Friedrich Hayek gave a series of public lectures entitled 'Prices and Production' at the London School of Economics … They were undoubtably the most successful set of public lectures given at LSE during my time there, even surpassing the brilliant lectures Jacob Viner gave on international trade theory. The audience, notwithstanding the difficulties of understanding Hayek, was enthralled. What was said seemed to us of great importance and made us see things of which we had previously been unaware. After hearing these lectures, we knew why there was a depression. Most students of economics at LSE and many members of the staff became Hayekians or, at any rate, incorporated elements of Hayek's approach in their own thinking. With the arrogance of youth, I myself expounded the Hayekian analysis to the faculty and students at Columbia University in the fall of 1931. For all his brilliance, Hayek didn’t — at the critical time — have a good enough understanding of the dangers of deflation. He didn’t fully realize the extent of sticky wages and prices and, more deeply, he didn’t see that ongoing deflation would render the “calculation problem” of a market economy more difficult. Hayek stressed that a market calculates value in a way that a central planner cannot — but lying behind this ability to calculate is some basic macroeconomic stability. At the key moments, Hayek did not offer the proper recipe for that stability. The first was a genius. The second was a moron--his could never make his arguments cohere either conceptually or empirically, but he kept doubling down on them and wound up in infinite reputational bankruptcy. The third was wrong--I would say blinded ex ante by ideology, others would say proved wrong ex post by events. Hayek says that the problem with classical liberalism was that it was not pure enough. The government needed to restrict itself to establishing the rule of law and to using antitrust to break up monopolies. It was the overreach of the government beyond those limits, via central banking and social democracy, that caused all the trouble. A democratic government needs to limit itself to rule of law and antitrust–and perhaps soup kitchens and shelters. And what if democracy turns out not to produce a government that limits itself to those activities? Then, Hayek says, so much the worse for democracy. A Pinochet is then called for to, in a Lykourgan moment, minimalize the state. After social democracy has been leveled and the rubble cleared away, then–perhaps–a limited range of issues can be discussed and debated by a–limited–restored democracy, with some kind of group of right-wing army officers descended from latifundistas Council of Guardians in the background to ensure that property remains sacred and protected, and the government small enough to fit in a bathtub. […] Hayek was formed in Austria. From his perspective the property and enterprise respecting Imperial Habsburg government of Franz Josef eager to make no waves, to hold what it has, and to keep the lid off the pressure cooker appears not unattractive. This is especially so when you contrasted would be really existing authoritarian alternatives: anti-Semitic populist demagogue mayors of Vienna; nationalist Serbian or Croatian politicians interested in maintaining popular legitimacy by waging class war or ethnic war; separatists who seek independence and then one man, one vote, one time. An “authoritarian” after the manner of Franz Josef looks quite attractive in this context–and if you convince yourself but they are as dedicated to small government neoliberalism as you are, and that the Lykourgan moment of the form will be followed by soft rule and popular assent, so much the better. And if the popular assent is not forthcoming? Then Hayek can blame the socialists, and say it is their fault for not understanding how good a deal they are offered. Hayek and Marx are similar in their research programs concerning the dynamics of capitalism, its cycles, and the way in which money is vital to capitalism. They both worked a long time to master the problem, but failed to arrive at a neat solution. Hence they both abandoned the program and went on to other, more urgent, concerns. But along the way, they both left a trail of great insights and unsettled debates. Hayek gave the best exposition ever of the unpopular ideas of economic freedom that somehow triumph anyway, alleviating far more national and global poverty than more fashionable Scandinavia-envy and grandiose plans to "make poverty history." Hayek did not talk about it at the time, but his warnings about the drift toward top-down planning were perhaps most relevant of all in the so-called Third World. It is the misfortune of the field called development economics that it was born at the moment of maximum doubt about individual liberty. As a result, economists conceived of development from the beginning—and to a frightening extent still do today—as a top-down process run by development experts operating on a blank slate. The great theme of his remarkable explorations in intellectual history is the danger of all constructivism, the belief that we can deliberately design social arrangements which will be better than those we unwittingly hit upon. Paradoxically, however, the drive of Hayek's own work is itself characteristically that of a rationalist construction. Admiring David Hume and detesting Auguste Comte, his genius was to marry the sceptical insights of the one to more than a touch of the compulsive rigour of the other. The investigation of this problem — How is spontaneous order possible? — is sometimes referred to as the 'Hayek programme'. I think that permanence and stability are the cardinal virtues of the legal rules that make private innovation and public progress possible. To my mind there is no doubt that a legal regime that embraced private property and freedom of contract is the only one that in practice can offer that permanence and stability … In reaching this conclusion, I have been heavily influenced by the work of Friedrich Hayek. Richard Epstein, in "Simple Rules for a Complex World" (1995). Though Hayek clearly allows for the possibility of a retreat from socialism, whether of the hot (command planning) or cold (welfare state) variety, and planning, Hayek’s critics, apparently taking Hayek at his word, use ‘inevitability’ to refer to the outcome (a totalitarian polity) that, according to Hayek, is supposedly generated by the cumulative logic inherent to interventionist policy and welfare state practices. Though taking care to note that a change in policy may occur, Hayek apparently considers the logic of intervention as primarily nudging policy in one direction, necessitating ever-further government intervention. Hayek frequently argued that any failure to adequately mend our ways—abandon “our” supposed infatuation with “social justice” and other “high ideals”—would inexorably put us in the hands of the devil. Arguably, “we”—Obama and company clearly included—have yet to change our ways. Much as Hayek’s penchant for claiming that “bad” interventionist policy will ineluctably drive us along the road to serfdom—ultimately culminating in full-blown command planning and political tyranny— is clearly apparent in his 1940s writings, the very same sentiments pervade the third part of The Constitution of Liberty. Hayek was never blind to the potential difficulties inherent in this political synthesis, nor dismissive of the serious criticisms of capitalist society and liberal theory presented by thinkers of the left. He explicitly disavowed the ideal of laissez faire and distanced himself from the sort of free market utopianism common among more extreme libertarians. He thought it foolish to pretend that capitalism always rewards those who work the hardest or are otherwise deserving, advocated a minimal social safety net for those incapable of supporting themselves in the market, and had no objection to government taking on tasks far beyond those defining the ‘‘minimal state’’ of Nozick’s libertarianism, so long as this did not result in monopoly and private firms were allowed to compete with government for provision of the services in question. Like Marx, he believed that liberal capitalist society has a tendency to produce alienation, insofar as the impersonal rules of conduct upon which it rests necessarily eschew any reference to a common social end or purpose, and thus cannot satisfy the deepest human yearnings for solidarity. Unlike Marx, he also thought we nevertheless simply have no alternative to capitalism if we want to maintain the level of individual autonomy and material prosperity that are the most prized characteristics of modernity, and that it is naive and dangerous to pretend otherwise. What of Ronald Reagan and Margaret Thatcher and their battles against government control of the economy? Here Hayek surprises. He does not disapprove of Reagan and Thatcher, but he has no high opinion of modem politicians in general. He does, however, say that Reagan's and Thatcher's policies "are as reasonable as we can expect at this time. They are modest in their ambitions." Modesty. The capacity to understand that well-meaning politicians — and their advisers, the intellectuals — will only wreak mischief if they try to guide economic development: This antipolitical concept is at the heart of Hayek's theory of economic and social development. There was someone who is clearly very important who also was not a member of the scientific commission, but whose career and trajectory was ultimately very important for the definition of contemporary neo-liberalism. This is the Austrian von Hayek. He came from Austria and from neo-liberalism; he emigrated at the time of, or just before, the Anschluss. He went to England and also to the United States. He was very clearly one of the inspirations of contemporary American liberalism, or of American anarcho-capitalism if you like, and he returned to Germany in 1962 where he was appointed professor at Freiburg, thus closing the circle. ... I am one of those who has learned a great deal from Hayek. I hope he is as effective as I think he will be in his teaching in Germany, but I also hope that we will see him back here very often indeed. Friedrich Hayek's influence has been tremendous. His work is incorporated in the body of technical economic theory; has had a major influence on economic history, political philosophy and political science; has affected students of the law, of scientific methodology, and even of psychology. Over the years, I have again and again asked fellow believers in a free society how they managed to escape the contagion of their collectivist intellectual environment. No name has been mentioned more often as the source of enlightenment and understanding than Friedrich Hayek's … I, like the others, owe him a great debt … his powerful mind … his lucid and always principled exposition have helped to broaden and deepen my understanding of the meaning and the requisites of a free society. In terms of his personal characteristics, Hayek was a very complicated personality. He was by no means a simple person. He was very outgoing in one sense but at the same time very private. He did not like criticism, but he never showed that he didn’t like criticism. His attitude under criticism, as I found, was to say: “Well, that’s a very interesting thing. At the moment, I’m busy, but I’ll write to you about it more later.” And then he never would! On the other hand, he wasn’t like von Mises. He wasn’t intolerant at all. You cannot conceive of Hayek doing the kind of thing that Mises did, when, for example, he wouldn’t talk to Machlup for three years because Machlup had come out for floating exchange rates at a Mont Pelerin meeting. Hayek did not do that. That was, I believe, because of the influence of the London School on him. He was very much tempered by the London School. Let me emphasize. I am an enormous admirer of Hayek, but not for his economics. That, again, is subject to misunderstanding. It depends on what you mean by economics. I’m not talking about his understanding of economics, his application of economics to the real world, or anything like that, but his contributions to the science of economics, not to economic practice, not to anything else. I think Prices and Production was a very flawed book. I think his capital theory book is unreadable. I cannot say I’ve read it. [laughter] It’s very unreadable. On the other hand, The Road to Serfdom is one of the great books of our time. His writings in [political theory] are magnificent, and I have nothing but great admiration for them. I really believe that he found his right vocation—his right specialization—with The Road to Serfdom. His earlier works were intended to be part of the literature of technical economics as a science, and, indeed, it was that characteristic of them that impressed Lionel Robbins and led Lionel to bring him from Austria to London. I never could understand why they were so impressed [at the London School of Economics] with the lectures that ended up as Prices and Production, and I still can’t.... these very confused notions of periods of production, different orders of products, and so on. John Kenneth Galbraith, in "Nicholas Kaldor Remembered", in "Nicholas Kaldor and Mainstream Economics: Confrontation or Convergence?" Sixty-two years ago I spent a year in what is known at Harvard as the other Cambridge. It was then in the high pulse of the Keynesian Revolution. Economic discussion was constant, intense, but London also called; once a week I came up to seminars here at the London School of Economics. A major attraction was Friedrich von Hayek, the noted conservative, author of “A Road to Serfdom,” his widely read analysis of the disastrous but emerging welfare state. He, however, was only slightly heard. The two hours were given over, all but exclusively, to telling him he was wrong. I found myself in support of this correction; it was education by the rebuke of error. (I trust that will not be the tendency on this pleasant and, for me, nostalgic occasion.) Over the years I’ve often presented myself to ardent conservatives as a student of von Hayek; it has added in an agreeable way to their normal confusion. Hayek's greatest failure is his neglect of the problem of private power. All his efforts go into the denunciation of state power, but he has little to say about private coercion. Hayek's attempt to delegitimize one side of the Western tradition is one of the most significant ideological closures in his work. It prevents him from seeing the close ties which exist between liberalism and socialism. Hayek’s lasting achievement was to focus attention on the limited and fragmented nature of knowledge in modern societies and the need for social and economic theorists to make that the cornerstone of their thinking. Yet in some ways he remained trapped in the rationalism he was so keen to reject. If our reason is so feeble, and if knowledge is necessarily imperfect and dispersed, how do we know this to be true? To make that claim Hayek has to take up the privileged status of observer that he is so critical of in constructivist rationalism. If he were not prepared to do so he could not justify his project of social and economic theory at all. Despite his denunciation of the ills of scientism and constructivism, Hayek is closer to the rationalism he criticizes than he might like to acknowledge. Hayek was an acute social theorist, but also an ideologue. He developed one of the most sophisticated theories of markets in social science, but he was also a market fundamentalist with a deep-rooted distrust of all forms of state regulation and state intervention, which tended to become more pronounced as he grew older. […] The paradox of Hayek's work however is that he stopped short of advocating either the kind of anarcho capitalism sought by some libertarians, or even the strict minimal state proposed by Robert Nozick. On the contrary he thought that the state needed to retain very strong powers to police the market order and prevent powerful interest groups such as trade unions from subverting it. But he fretted constantly about how this might be achieved, and how democratic governments could be persuaded to cease interfering with markets. Hayek's theory of knowledge is his greatest achievement, and offers insights that should be utilised by both right and left, but he failed to apply them to one of the central aspects of the modern era - the way science and technology are utilised in increasingly perverse ways by a deregulated neo-liberal market economy, which if not checked will have devastating consequences for the biosphere and the survival of the human species. It is an example of how his market fundamentalism blinds him to conclusions to which his own analysis of markets should have led him. If he had followed the logic of his own argument, he might have arrived at a rather different view of the appropriate balance between the state and the market, and provided a more searching account of the nature and limits of government action, or as Keynes would have put it, between the agenda and the non-agenda of government. The resources for doing so are there within Hayek's thought, which remains a seminal contribution to modern social theory, but he chose not to develop his ideas in this direction because of his ideological commitment to market fundamentalism. That should not prevent others from doing so. It is increasingly urgent that we should. Friedrich A. von Hayek, one of the strongest, and at times one of the few, economic voices advocating the reduction of government's role in the economy, is finally finding himself in the position of a Cassandra who suddenly that discovers people are listening. Hayek's work composes a system of ideas, fully as ambitious as the systems of Mill and Marx, but far less vulnerable to criticism than theirs because it is grounded on a philosophically defensible view of the scope and limits of human reason. No-one who knows Hayek's work can doubt that his attempt to restate liberal principles in a form appropriate to the circumstances and temper of the twentieth century has yielded a body of insights wholly comparable in profundity and power with those of his forebears in the classical liberal tradition. Conservative ideologues have used Smith's insight--that market exchange produces an order in human affairs that no one has designed--to defend their free-market policies. Chief among them was F.A. Hayek, the Nobel Prize-winning Austrian economist who became one of the gurus of the intellectual right in the '80s. Hayek argued that the market evolves as an unintended consequence of human activity, claiming that it embodies wisdom inaccessible to any single generation and insisting that it must therefore be accepted as the basis of society. In a devastating critique of Hayek's views, Rothschild dissects the multiple ambiguities of his notion of social order and shows how removed it is from anything in Smith. Hayek believed that we must submit to the unfathomable workings of the market, but this blinkered reverence for social process was unacceptable to Smith, who viewed the market as a human construction. I still see Hayek as the best critic of all forms of centralized economic planning. It is to his merit to have shown scientifically that centralized planning cannot work for an economy because complete knowledge of that economy is never available centrally. As nice as it would be to have one, there is no mastermind who knows and can control everything, and there never will be. This was Hayek's scientific argument for the superiority of the market economy. A planned economy is only a viable means where there is a clear overarching goal – during wartime. A war economy is always a planned economy. Supporters of central economic dreams should therefore hear it once and for all: centralized economic planning is not suitable during peacetime. He who states that markets cannot fail, that market failure is always the result of government intervention, is a dogmatist. How the hell would he know? Overall, Hayek was not a dogmatist, although in his writings there can be found traces of such a liberal utopianism. There we encounter the motto: "What is not supposed to be, must not be! And what must not be, is not!" To me, all isms are suspicious anyway. The sceptic in me asks: why should markets be more reasonable than other human institutions? And we can see it every day: markets are also imperfect, prone to error, and in need of repair, like everything else that man has created. Hayek watched the interwar collapse with horror, as Keynes did, and shared many of Keynes’s liberal values. What he failed to understand is that these values cannot be renewed by applying any formula or doctrine, or by trying to construct an ideal liberal regime in which freedom is insulated from the contingencies of politics. Hayek’s Road to Serfdom (1944), also written during the war, was too pessimistic, I believe, about the capability of present-day capitalism in most Western countries to adjust to maladjustments in the structure of production without causing intolerable unemployment. Excessive pessimism also appears in Hayek’s later writings. In Full Employment at Any Price? (1975), for example, he refers to the inflationary excesses of the 1970s as “the present crisis,” I do not wish to minimize the dangers of inflation. However, the experience of the 1980s bothin the United States and Europe shows that inflation can be stopped without producing more than relatively mild recessions. At the time of his death, F.A. Hayek (1899–1992) was unquestionably the world’s preeminent spokesman for classical liberalism and its most important thinker. He led an immensely productive life, over the course of which he made significant contributions to a variety of disciplines, among them economics, political and social theory, psychology, and the history of ideas. There were two explanations, and one is that in Hayek and Friedman you had an absolutely marvelous cast—two people, one very bouncy and saucy and cheeky and outspoken, vigorous. This is Friedman. He was always bouncing out with ideas; sometimes they were a bit farfetched. Then you had Hayek, this very correct and rather serious, portly, gracious, slow, rather ponderous-speaking, sometimes thinking what his next sentence is going to be. And they were men unruled by any ambition, not trying to create a party, to get elected, to win votes—any of that. It was an amazing success of upright men of integrity, intellectual brilliance, not flashy, but very impressive to watch them performing over a wide range of topics. It was from Hayek that I began. John Hicks, Money, Interest and Wages (1982), p. 28; on his "Equilibrium and the Cycle" (1933), an influential work on the topics of intertemporal equilibrium, monetary theory, and trade cycle phenomena. Hayek was making us think of the productive process as a process in time, inputs coming before outputs. If Hayek believes that the spending of newly-printed currency on employment and consumption will worsen our current terrible depression, then Hayek is a nut. John Maynard Keynes, Collected Works, vol. XII on Hayek's Prices and Production (1931); Hayek provided historical background up to page 45, after that came his theoretical model. I am in full agreement, also, with Dr. Hayek's rebuttal of John Stuart Mill's well-known dictum that "there cannot, in short, be intrinsically a more insignificant thing, in the economy of society, than money," which he expresses admirably in the following passage from his last lecture: "it means also that the task of monetary theory is a much wider one than is commonly assumed; that its task is nothing less than to cover a second time the whole field which is treated by pure theory under the assumption of barter, and to investigate what changes in the conclusions of pure theory are made necessary by the introduction of indirect exchange. The first step towards a solution of this problem is to release monetary theory from the bonds which a too narrow conception of its task has created." Hayek's mature appreciation of a society built on the foundations of individual rights, the rule of law, and limited government can thus be traced directly to his own extension of the subjectivism of the Austrian tradition in economics. It must be emphasized that the economic understanding of markets which emerges from the Austrian tradition differs sharply from the understanding of markets which informs the minimal-statist position of many mainstream economists. Two decades after Hayek´s death history is on the move again. State interventionism is back and growing, the Reagan-Thatcher era long forgotten, as is the Communist era. State paternalism, regulation and control, social and environmental blocking of the functioning of markets, constructivism and dirigism are here again and, especially in Europe, are stronger than ever. We must get back to Hayek’s teachings. We must once again take his books into our hands and try to spread his thoughts all over the world, because now they are as relevant as in the past. Hayek’s quarrels with Aristotle are of the same character as his conversations with Sir Karl Popper and Milton Friedman: the welcome criticism of peers, those who can recognise the same premisses needed to define a given problem, however they may come to differ over their conclusions. Only now do we begin to realise that something valuable may have been driven from the world when the continuity and tradition of Western civilisation was shattered in the same blows that destroyed unwanted empires. Now in Eastern Europe there is nostalgic talk of the good old days under the Hapsburg empire. The evolution of knowledge is inseparable from the evolution of language, and something invaluable is lost when ‘sound bytes’ replace the human voice, heard in face-to-face discussion of mutual concerns. Inflection counts for much, and what is not said can only be recognised when allusion and irony are possible. So Vienna waltzes. The most intelligent defender of capitalism today … who has as fine and as powerful a mind as is to be found anywhere. As a result of the efforts of Hayek, Friedman, and the many others who share their general outlook, the idea of a centrally planned and centrally administered economy, so popular in the 1930s and early 1940s, has been discredited. Hayek has as fine and as powerful a mind as is to be found anywhere, and [his] "Constitution of Liberty" is one of the most thoughtful works of the last decades. It is in good part because of Professor Hayek's work [on the topic of social engineering], and also because of his profound insights — most notably in "The Constitution of Liberty" — into the connection between a free market, the rule of law, and individual liberty, that you don't hear professors saying today, as they used so glibly to say, that 'we are all socialists now. But the Hayek thing is almost entirely about politics rather than economics. Without The Road To Serfdom — and the way that book was used by vested interests to oppose the welfare state — nobody would be talking about his business cycle ideas. The central dilemma of Hayek's political philosophy is, given his view of the limited role reason can play in social life, how is it possible to mount a systematic defence of liberalism without falling victim to the very kinds of rationalism he criticises? This difficulty stays unresolved in Hayek’s political thought because it is informed by two incompatible assumptions about what reason can achieve. This tension in Hayek's thought, between the rationalist advocacy of liberal reform and the anti-rationalist critique of all social reconstruction, has inclined one commentator to describe his political theory as 'Utopian non-engineering'. While the word 'Utopian' might exaggerate a little the rationalist character of his thought, this term captures well the unstable nature of the Hayekian system of ideas. For, in the end, a Humean scepticism about the powers of reason is incompatible with a Kantian insistence on the priority of rationally justifiable principles. Hayek has tried to cast himself in the image of that most improbable of creatures: the principled sceptic. Hayek’s views should be considered because, in addressing institutional questions, he has not made the mistake of confining the problems of liberalism within national boundaries. Hayek should be taken seriously because he has correctly identified as the most serious problems confronting civilization in the twentieth century the problems of nationalism and totalitarianism. Even with the dereliction of European communism at the end of the twentieth century, the problems which remain or are reemerging in the shape of ethnic conflict, separatist national movements, and regional trading blocs stem from practices and ideas which the liberal tradition has consistently criticized: ideas hostile to individualist, universalist, and egalitarian moral principles. While thinkers like Hannah Arendt have also recognized the threat and moral danger posed by totalitarianism, it is in Hayek’s work that we have the most thorough attempt to understand the logic of its institutional alternative. Roughly speaking, Lundberg argued that Gunnar Myrdal's work has been enormously important, and noted that there was local pressure on the Nobel Prize Committee to recognize him, but wondered how it would be received abroad if this was done. (Remember that the Prize was then rather new, and Lundberg had to be careful about its reputation.) Giersch's reply was that the quality of the work surely merited the award, but maybe the politics of it would be easier if there was a joint recipient who was neither Swedish nor shared Myrdal's views – what about Hayek? That's it – is this where Hayek's prize came from, or was he already high on the list, or what? Hayek is by no means as rational and irrefutable as the right would have it. Indeed, he is often eccentric. He is a romantic, a serious deficit in a social theorist. Many of his arguments rest on a reductionist idea of socialism, and his conception of the sources of law can only be called mystical. But Hayek is not merely an eccentric mystic. In Road, first published in 1944, he makes a powerful and far-ranging critique of state control of economic life. At least as far as he takes the argument in this book, there isn’t much that thoughtful modern liberals or even democratic socialists who understand the power of markets would necessarily object to—although they might feel that there is more to the story than Hayek acknowledges. Hayek doesn’t seem to grasp that human beings can exist both as individuals and as members of a society, without necessarily subordinating them to the needs of an imposed social plan (although he acknowledges that the state can legitimately serve social needs, he contradictorily views collective benefits as incompatible with individual freedom). He rejects the very concept of social justice, for much the same reasons that he rejects the arbitrary valuation of labor: in Hayek’s view there is no way to put an objective value on a grievance or to weigh it against other claims. And because he locates all responsibility and agency only at the level of the individual, he sees no way in which any claim can be generalized to society. Hayek’s political philosophy recognizes only negative rights. Positive fulfillment beyond the most basic needs is a matter of individual striving. In the 20th century, three world wars facilitated a Communist revolution, a Fascist backlash and the subsequent collapse of both. The weakness of bureaucratic information flows (relative to market-based competitors) undermined Communist economies – a point emphasized by Frederick Hayek, the co-leader (with Murray Rothbard) of the fourth generation Austrian School of Economics. Flows of information and disinformation played pivotal roles in the First, Second and Third (that is, Cold) World Wars. Friedrich Hayek is the twentieth-century social theorist who, probably more than any other, found himself vindicated by events — if not wholly, then at least in his central contention. He is also the one who, more than any other, himself exercised a significant political influence. Although he is very probably unaware of this book and of my work in general, I want to express a very belated thanks to Friedrich A. Hayek. His work had much more of an influence on me than I realized during the writing of the First Edition [of "The End of Liberalism"] I neither began nor ended as a Hayekist but instead found myself confirming, by process of elimination and discovery, many of his fears about the modern liberal state. It is likely that many modern economists would have no difficulty accepting Hayek's statement of the problem (of macroeconomics) as roughly equivalent to their own. Whether or not this is so, I wish … to argue that it should be so, or that the most rapid progress toward a coherent and useful aggregate economic theory will result from the acceptance of the problem statement as advanced by [Hayek]. One of the most original and most important ideas advanced by Hayek is the role of the "division of knowledge" in economic society … [But if] I had to single out the area in which Hayek's contributions were the most fundamental and pathbreaking, I would cast my vote for the theory of capital. As I said before, when I reviewed Hayek's book on The Pure Theory of Capital, it is "my sincere conviction that this work contains some of the most penetrating thoughts on the subject that have ever been published." If two achievements may be named, I would add Hayek's contributions to the the theory of economic planning. Most of what has been written on systems analysis, computerized data processing, simulation of market processes, and other techniques of decision-making without the aid of competitive markets, appears shallow and superficial in the light of Hayek's analysis of the 'division of knowledge', its dispersion among masses of people. Information in the minds of millions of people is not available to any central body or any group of decision-makers who have to determine prices, employment, production, and investment but do not have the signals provided by a competitive market mechanism. Most plans for economic reform in the socialist countries seem to be coming closer to the realization that increasing decentralization of decision-making is needed to solve the problems of rational economic planning. Well I mentioned Hayek. There are two ways. One is because of my interest in political economy. The other way is that Hayek was a pioneer in the use of information in economics. One of the papers that Karl and I wrote together that I continue to like was a paper called "The Uses of Money". In that paper we tried to incorporate information and the cost of information to explain why people use money. One of Hayek's most basic ideas is that institutions are a way of reducing uncertainty. Man struggles to find institutional arrangements which on average make life a bit more predictable. Our "Uses of Money" is not so much about money as we conventionally think about it, it's about the idea of a medium of exchange, the function of an institution called the medium of exchange and how the medium of exchange as an institution resolves a part of peoples uncertainty about the future. All of this, of course, establishes Hayek's primacy over Hicks in the origin of the notion of intertemporal equilibrium. Although the democratic left is unlikely to find his views very palatable, at least one lesson can be learned by contemplating Hayek’s life. He shows us what can sometimes be achieved by sticking doggedly to your guns, ignoring intellectual fashion, and waiting until your moment comes. Hayek had only one tune to play, the virtues of the free-market economy as opposed to central planning, but he played it with panache, could improvise longer or shorter versions as the occasion demanded, and above all never gave up practicing. He relapsed into a crude identification of socialism with Soviet-style central planning, even though, in the West at any rate, there were very few actual socialists who continued to accept that equation. If the central contest of the twentieth century has pitted capitalism against socialism, then F. A. Hayek has been its central figure. He helped us to understand why capitalism won by a knockout. It was Hayek who elaborated the basic argument demonstrating that central planning was nothing else but an impoverishing fantasy. Friedrich A. von Hayek, winner of the Nobel Memorial Prize in Economic Science, says that on the whole he approves of the economic policy of the Reagan Administration. Yet, when he discusses particulars, Professor von Hayek - a conservative who is best known as an unrelenting opponent of Socialism and lesser forms of economic interventionism -sounds less than approving. He applauds the determination in Washington and London to stop inflation but laments that both Governments seek gradual progress. "You have to do it rapidly and drastically," he says. Information costs are reduced by the existence of large numbers of buyers and sellers. Under these conditions, prices embody the same information that would require large search costs by individual buyers and sellers in the absence of an organized market. (footnote 4: The original contributions were those of Hayek (1937 and 1945)). I was very flattered when I once got a note from Hayek saying that he would like to come and talk with me. He had read The Rise of the Western World, and he thought it was a very interesting book. He came to Seattle and spent two days with me. We had a good time and I really enjoyed him. But I wish I had known then what I have learned since, so that I could have appreciated his visit more appropriately. I had never read his stuff on cognitive science in those days. He still seems to me the greatest economist of the twentieth century, and by a long way. If you look for people who really want to try and understand the world, Hayek came closer to that ideal than anybody who has ever lived. Arguably the most influential economist of this century. I can testify from personal experience to the immense stimulus and direction which Hayek's migration to this country [Great Britain] gave to economic research in the 1930s, not only in London and economics faculties throughout the United Kingdom, but also in the international world of scholarship. I think that I have learned more from you than from any other living thinker, except perhaps Alfred Tarski … but not even excepting Russell. But apart from the field of intellectual production, you have done so much for others. There are many former students you have encouraged and helped on their way. And there are many who, like myself, have been helped by you in the most critical stages of their development. You will never know how much you have done for me. When I was in New Zealand, out of the world and buried by all my philosophical colleagues, you remembered me. It was through you that I came back into the world. It was through you (and Ernst Gombrich) that The Open Society was published, after a period (before you interfered) which led...me almost to despair. And when I came to the LSE [London School of Economics], through you, you gave me so much encouragement and help....There cannot be, ever, equality or reciprocity between you and me. I never could do anything for you, and it is extremely unlikely that I ever shall. I have created myself a kind of generational gulf between you and myself. Although you were only 3 years old when I was born, you became, as I now realize, a kind of father figure....[E]ven now, when I am 82, and we have been friends for so many years, you still are! And, strangely enough, you yourself...described your feelings towards me as those towards a young man who has made good. I should like to mention that I did not know Hayek’s book (The Road to Serfdom) when I wrote mine; in fact, my book was finished about six months before his. All I knew was a little pamphlet “Freedom and the Economic System,” in which he advocates “Planning for Freedom.”...The acknowledgement in my book refers to his practical help rather than to his influence; but since I wrote my book, I have read Hayek’s book (and several excellent articles), and I can only say that I have learned a very great deal from it. A few leftists here in England are in the same position ....Hayek, who I had seen only four or five times before, has been really wonderful to me in his many repeated approaches to various publishers, and I understand from the people here in the School [the London School of Economics] that he is always so. His interest in my book was mainly due to the fact that he too is hoping for a common basis of discussion for socialists and liberals. Well … I've always been a voracious reader — I have read the economic views of von Mises and Hayek, and … Bastiat … I know about Cobden and Bright in England — and the elimination of the corn laws and so forth, the great burst of economy or prosperity for England that followed. As someone who came to Fredrick von Hayek comparatively late in life, I’m still catching up with him…Indeed, many of the insights I thought I had discovered in my own readings and writings on the frontier of evolutionary biology and economics it turns out Hayek had long before me…The field of anthropology and archaeology needs Hayek quite badly. I very well remember Hayek's visit to Cambridge on his way to the London School. He expounded his theory and covered a black-board with his triangles. The whole argument, as we could see later, consisted in confusing the current rate of investment with the total stock of capital goods, but we could not make it out at the time. Lange argued that what economists now call neoclassical price theory showed the possibility of combining central planning and the market, and Hayek retorted that planning would subvert at its heart the mechanism that gave capitalism its vitality. Hayek’s criticisms of market socialism, and more recently those of Janos Kornai, are for the most part on the mark. But the experiences of capitalism, as well as of socialism, in the last fifty years suggest ways of reformulating the concept of market socialism in response to the Hayekian critique of its intellectual ancestor. While often right and enormously influential, Hayek himself agreed that some of his predictions did not become true. The Hayek I met on various occasions – at the LSE, at the University of Chicago, in Stockholm (1945), at Lake Constance-Lindau Nobel summer conferences – definitely bemoaned progressive income taxation, state-provided medical care and retirement pensions, fiat currencies remote from gold and subject to discretionary policy decisions by central bank and treasury agents. Hayek fails to account either for the passion among intellectuals for equality, or for the resulting success of socialists and their egalitarian successors in driving the liberal idea from the stage of politics. This passion for equality is not a new thing, and indeed pre-dates socialism by many centuries, finding its most influential expression in the writings of Rousseau. There is no consensus as to how equality might be achieved, what it would consist in if achieved, or why it is so desirable in the first place. But no argument against the cogency or viability of the idea has the faintest chance of being listened to or discussed by those who have fallen under its spell. Hayek sees that the zero-sum vision is fired by an implacable negative energy. It is not the concrete vision of some real alternative that animates the socialist critic of the capitalist order. It is hostility toward the actual, and in particular toward those who enjoy advantages within it. Hence the belief in equality remains vague and undefined, except negatively. For it is essentially a weapon against the existing order – a way of undermining its claims to legitimacy, by discovering a victim for every form of success. The striving for equality is, in other words, based in ressentiment in Nietzsche’s sense, the state of mind that Max Scheler identified as the principal motive behind the socialist orthodoxy of his day. It is one of the major problems of modern politics, which no classical liberal could possibly solve, how to govern a society in which resentment has acquired the kind of privileged social, intellectual, and political position that we witness today. I am not persuaded that Hayek got the substantive connections entirely right. He was too captivated by the enabling effects of the market system on human freedoms and tended to downplay - though he never fully ignored - the lack of freedom for some that may result from a complete reliance on the market system, with its exclusions and imperfections, and the social effects of big disparities in the ownership of assets. But it would be hard to deny Hayek's immense contribution to our understanding of the importance of judging institutions by the criterion of freedom. Our debt to Hayek is very substantial. He helped to establish a freedom-based approach of evaluation through which economic systems can be judged (no matter what substantive judgments we arrive at). He pointed to the importance of identifying those services that the state can perform well and has a social duty to undertake. Finally, he showed why administrative psychology and propensities to corruptibility have to be considered in determining how states can, or cannot, work and how the world can, or cannot, be run. Hayek himself gradually identified with classical liberalism in a more specific sense. But it seems to me an open question just where his arguments should lead us. Hayek himself started with socialist concerns and sentiments. He also clearly favored extra-market welfare provision, at least within rich countries, and his Road to Serfdom allows for government to play quite a considerable role. I would have thought that his arguments point us in the direction of ideas that everyone should pay attention to, rather than just offering a positive program for one specific view of politics. At the same time we may find that the kind of structural characteristics that he discerns in our society, and the kind of freedom we need in order to learn, may make certain kinds of otherwise attractive ideals difficult to pursue. They may also, however, make it difficult for us to solve certain other kinds of problem – such as some issues concerned with the environment. Friedrich Hayek, who died on March 23, 1992 at age 92, was arguably the greatest social scientist of the twentieth century. By the time of his death, his fundamental way of thought had supplanted the system of John Maynard Keynes — his chief intellectual rival of the century — in the battle since the 1930s for the minds of economists and the policies of governments." [Hayek] became [in his later years] the dominant intellectual influence of the last quarter of the twentieth century. Which of Hayek's ideas are now widely accepted? I can't think of any. … Hayek's big idea - basically, that efficient market outcomes are emergent - is absent from most econ (though supported by lab experiments). Hayek, in my view, is the leading economic thinker of the 20th century. I first had to discover certain things for myself, and essentially it was the behavior I observed in human subjects in my laboratory study of markets that motivated me eventually to study Hayek seriously. Reading with the eyes of a new mind, I was able to appreciate an enormous depth of understanding in the work of Hayek that would have escaped me if I had not had this personal experience in the laboratory. Mrs. Hayek, I want you each day in the future to address your husband and inquire what his progress has been in what I consider to be one of the most interesting and intriguing fields, the evolution of the work of scholars. What's the single most important thing to learn from an economics course today? What I tried to leave my students with is the view that the invisible hand is more powerful than the [un]hidden hand. Things will happen in well-organized efforts without direction, controls, plans. That's the consensus among economists. That's the Hayek legacy. During the following decade [of the 1950s] modern economic history took a dramatic swing away from the liberal-left consensus established by the Hammonds, Tawney and the Webbs. The seminal text for this change of direction was the 1954 collection of essays compiled by F. A. Hayek, "Capitalism and the Historians". Even by the standards of his day Friedrich Hayek’s thought was wide-ranging and covered fields as diverse as economics, psychology, jurisprudence and social and political theory. Yet, despite this heterogeneity, underlying his intellectual contribution is a unifying philosophical approach centred upon a conception of mind and of the nature of reason. It is to this foundational aspect of Heyek’s thought, then, that attention must be paid if one is to understand his wider contributions. Regrettably, in an introductory text, there is only so much in-depth critical appraisal that one can undertake. For this reason, and by setting out his views on a variety of topics and appraising them where possible, the main purpose of this book will be to familiarise the reader with the principal themes of Hayek’s thought and to ascertain the extent to which his contributions may be considered to form a coherent system. Our inspiration was less Rab Butler's Industrial Charter than books like Colm Brogan's anti-socialist satire, Our New Masters … and Hayek's powerful Road to Serfdom, dedicated to 'the socialists of all parties'. Such books not only provided crisp, clear analytical arguments against socialism, demonstrating how its economic theories were connected to the then depressing shortages of our daily lives; but by their wonderful mockery of socialist follies, they also gave us the feeling that the other side simply could not win in the end. That is a vital feeling in politics; it eradicates past defeats and builds future victories. It left a permanent mark on my own political character, making me a long-term optimist for free enterprise and liberty. Adam Smith, the greatest exponent of free enterprise economics till Hayek and Friedman. For Dicey, writing in 1885, and for me reading him some seventy years later, the rule of law still had a very English, or at least Anglo-Saxon, feel to it. It was later, through Hayek's masterpieces "The Constitution of Liberty" and "Law, Legislation and Liberty" that I really came to think this principle as having wider application. All the general propositions favouring freedom I had … imbibed at my father's knee or acquired by candle-end reading of Burke and Hayek .."
The key importance of the amount of information available and the frequent lack of relevant information have been dealt with only in the last decades. L. von Mises and F. A. von Hayek can rightly be regarded as pioneers in this connection. The most interesting among the courageous dissenters of the 1980s were the classical liberals, disciples of F. A. Hayek, from whom they had learned about the crucial importance of economic freedom and about the often-ignored conceptual difference between liberalism and democracy. Everyone in Boston of a certain age knows the story of Rosie Ruiz, the marathoner who crossed the Boston finish line in 1980 at 2:31.56, flabby thighs and all, having barely broken a sweat. Despite mounting skepticism, she basked in the glory of having run the third-fastest female marathon in history – for a few days, that is, until a couple of students remembered seeing her jump out of the crowd half a mile from the finish. Something of the sort has been going on recently with the shade of Friedrich von Hayek. The Austrian economist, who died in 1992 just short of what would have been his ninety-third birthday, never made false claims for himself – far from it: he knew all too well the loneliness of the long distance runner. And scrupulous work as editor by the late W.W. Bartley, interpreter Bruce Caldwell, and biographer Alan Ebenstein, have made it possible to see the man clear. But the claims conservatives are making about the role he played as an economist are beginning to smack of Ruizismus. That is, they have jumped a caricature out of the bushes late in the day and claim that their guy ran a great race. Nearly two decades ago, during dinner with the late Nobel laureate Friedrich Hayek, I asked him if he had the power to write one law that would get government out of our lives, what would that law be? Hayek replied he'd write a law that read: Whatever Congress does for one American it must do for all Americans. He elaborated: If Congress makes payments to one American for not raising pigs, every American not raising pigs should also receive payments. Obviously, were there to be such a law, there would be reduced capacity for privilege-granting by Congress and less influence-peddling. Coming back to the question in the heading: how should Hayek be seen, after all, as an intellectual hero or an ideologue? In my (European) view, the answer would be: Under the historical condition which Hayek developed his liberal social philosophy, his courageous opposition to a fashionable, pro-socialist Zeitgeist made him an outstanding intellectual. However, as I tried to point out, he misunderstood or did not wish to understand the role of income redistribution in a free society. Instead, his continued crusading against allegedly atavistic ideals of material equality puts income redistribution at par with socialist irrationalism. This one-sided interpretation paved the way for his arguments to be over-simplified for political partisanship in the United States. Hayek’s new adherents fail to account for his intellectual stature and make him appear post mortem like an ideologue. This page was last edited on 14 January 2019, at 21:22.